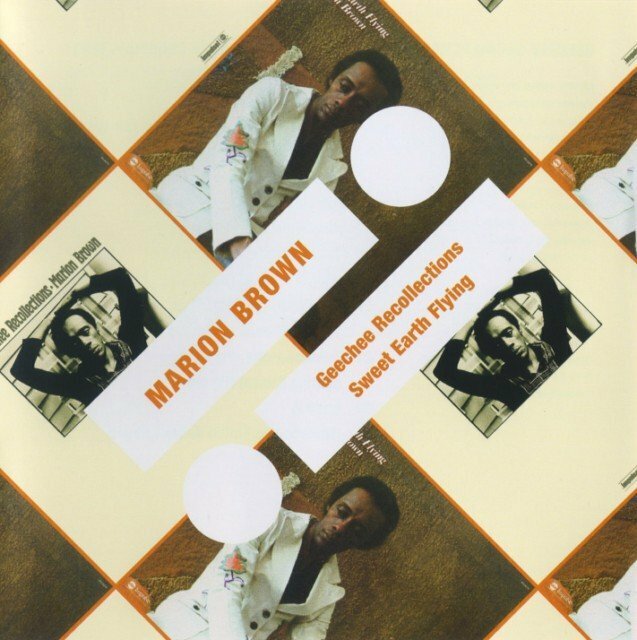 This single-disc volume brings together the first two chapters in saxophonist and composer Marion Brown's stellar Impulse! trilogy. 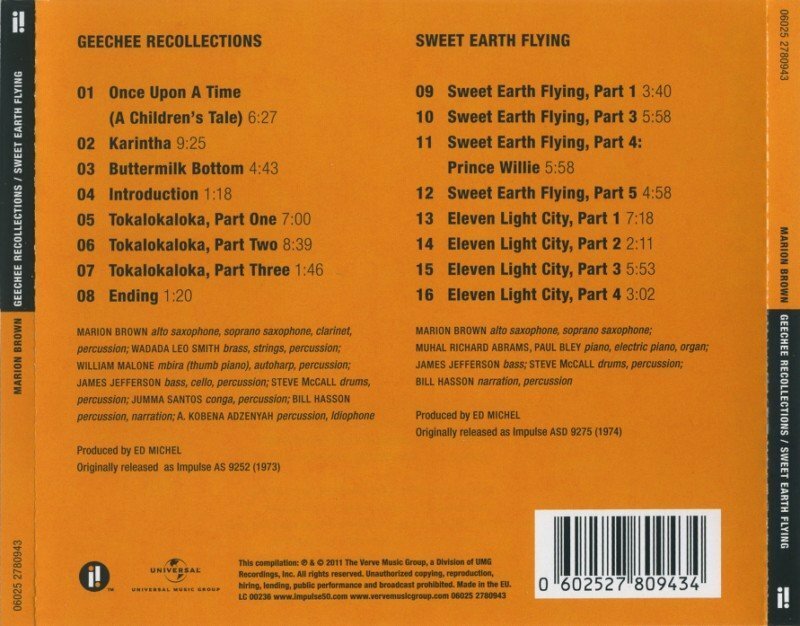 Geechee Recollections (1973) and Sweet Earth Flying (1974) are, along with their final chapter, Vista (1975), arguably the finest moments in his catalog. Thematically, these two titles and Vista examine and celebrate the legacy of poet Jean Toomer and also revisit Brown's childhood in Atlanta and around the Georgia countryside. They are grounded in Southern folk themes and blues with just a kiss of funk. The musicians on Geechee Recollections are vocalist Bill Hasson (who actually does a long-form accompanied sung/spoken recitation of Toomer's poem "Karintha"), percussionist Jumma Santos, trumpeter (pre-Wadada) Leo Smith, drummer Steve McCall, and bassist James Jefferson as well as others on percussion. Brown plays alto, soprano, and clarinet. 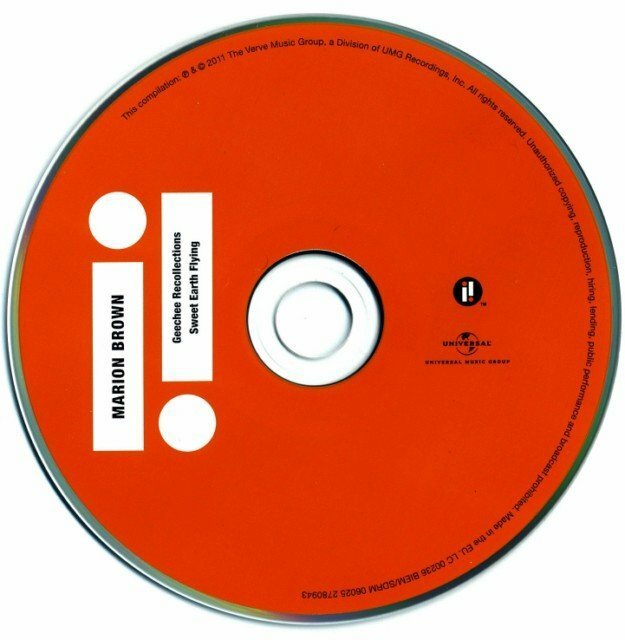 The second of these two albums acts as a mirror image to the first. While the themes are the same, none of Toomer's poetry is actually used and Hasson speaks on only one selection. While there was no piano on Geechee Recollections, there are two pianists on Sweet Earth Flying, in Muhal Richard Abrams and Paul Bley. Both players use Rhodes as well as acoustic pianos, and Abrams plays an organ on the fourth part of the title suite. The rhythm section features Jefferson on upright and electric bass and McCall on drums and percussion. What holds everything together is Brown's playing: it always begins quietly and tentatively, almost haltingly, in the way he poetically approaches the material. On all his horns, however, he soon becomes the voice of authority underscoring his bandmembers as well as singing above them, pushing them toward something he wants them as well as the listener to be able to grasp aurally. While it would have been terrific to have this be a double disc with Vista added to round out the trilogy, the two albums presented here are a stellar introduction to Brown's most creative period. Remastered from analog tapes, the sound is full, rich, spacious, and warm.